Anim18 the year-long, UK-wide celebration of animation is continuing to announce more events. However, this latest may just be the most unusual. 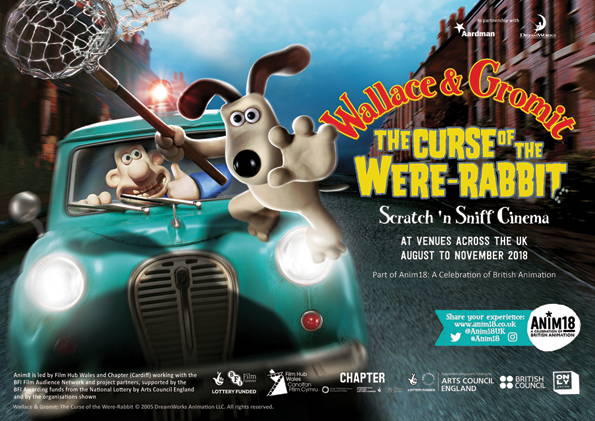 Aardman Animation's Oscar-winning feature film Wallace And Gromit: Curse Of The Were-Rabbit is returning to cinemas... with Scratch and Sniff screenings. Running from August to November, the touring event will see audiences handed scratch and sniff cards "with smells to expel at key moments in the film including Stinking Bishop, Bunny Burps and Stale Underpants!" This will be the latest in a series of 'Scratch ‘n Sniff Cinema Presents' screenings of films including Matilda, The Wicker Man and The Goonies. The series comes from producer and artist Bren O’Callaghan and illustrator Simon Misra. "Smell is often ignored as a stimuli for playful response, but it’s a powerful emotional trigger," says O'Callaghan. "It can remind us of a person, a place, or transport us to a sun-soaked day long since passed." "We spend ages working on how our films look and sound because that is how cinema works. Entertainment for your eyes and ears. So having the ability to add smell to the cinematic experience is tantalising, your nose will be left out no longer" added Aardman's Merlin Crossingham. "I also think that it is something that Wallace would have had simmering away in his workshop. The Smelly-Telly: Emanating entertaining aromas direct to your nostrils." Here's the initial list of venues and festivals that will be hosting the screenings. Additional dates to be added. Check Anim18 for updates and to find out more.